This memo was presented part of a workshop organised by the LSE Middle East Centre looking at the Saudi–Iran rivalry in the region on 7 May 2018. 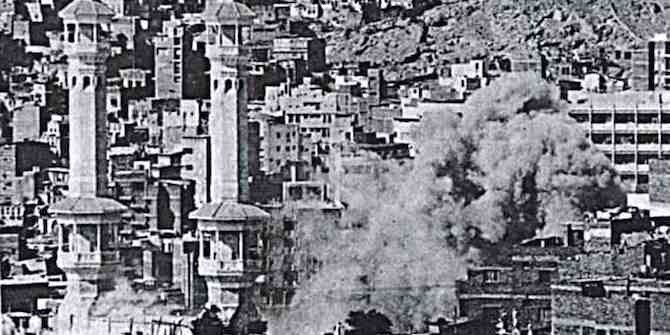 Smoke rises from the Grand Mosque in Mecca during the siege against Juhayman al-Otaybi’s fundamentalist armed group in December 1979, while in Iran Ruhollah Khomeini was being declared Supreme Leader. The relationship between Saudi Arabia and Iran in the contemporary Middle East can be seen as one of competing legitimacies within a disordered system. This competition does not seem manageable in the way many people assume; and ultimately it confronts policy-makers with hard choices, unless the states they represent simply want to withdraw from the arena of geopolitical competition. There is a revealing dialectic in the way both Iran and Saudi have used Islamisms of various sorts to frame their own national projects, to legitimise state authority and as an instrument of external policy. Today, the Islamic Republic is challenged by what seems to be significant, broadly-based and enduring popular dissatisfaction with its performance, particularly over the economy but also interestingly nationalism –therefore based in a powerful sense of Iranian rather than Shi’a particularism (here, here and here). The Saudi state – certainly as we have understood it since the early 1950s – is the subject of an ambitious but ambiguous programme of domestic reform, apparently also in the field of religion. In addition, both countries are faced by the emergence of various forms of dissident and often highly violent Islamisms in the broader region. Hence, we might reflect on the significance for our current policy direction – or lack of it. The modern Saudi state like its predecessors was constructed by conquest on the basis of a claim to a renewed, rethought and nativist Islamic authenticity. The complex Salafism (here, here, here, here, here, here and here) that underlies the state, in spite of its shifts and compromises, is ideological purposeful. In contrast to the rulers of the first Saudi state, founder of Saudi Arabia King Abdul Aziz may have been pragmatic when it came to his own position. If he was ever tempted to claim the title of Caliph, he never did so, preferring to consolidate his rule in the heartlands of the Arabian Peninsula rather than cultivating the extra-territorial ambitions and seeking the sort of external confrontations that had destroyed his predecessors in the early 19th century. But the central claims of Saudi Hanbali/Wahhabi/Madkhali Salafism about the religious legitimacy of a ruler and the duty of allegiance owed to him remain foundational to the state he created. The Islamic Republic of Iran in contrast is the creation of a vanguardist Islamist movement, making analogous political claims to Saudi Salafism, that emerged out of dissident groups opposed to constitutionalism and the aggressive secularism of the Pahlavis. They seized and consolidated power after 1979 with the help of praetorianised security forces and contributed over the last 25 years to the creation of a massively expanded clerico-military class dependent on the Office of the Supreme Leader and its associated foundations (here, here, here, and here). One state, that is, is foundationally concerned with the restoration and preservation of what it sees – doubtless for its own elite purposes – as a pre-existing and legitimate political order within a defined territory and the wider promulgation of a loyalist Islamic orthodoxy; the other with the overthrow of a different but related domestic and regional order, which functions as a microcosm of an unjust global order. Each state is Islamist in the sense of deriving its political purpose and legitimacy from particular readings of orthodoxy and orthopraxy. The relationship of each state to competing forms of Political Islamism has been and remains complex. The Saudi state supported the Muslim Brotherhood from its foundation until the ideological turn of the 1990s. It also supported related groups in conflicts in Afghanistan and the Balkans, largely in order to combat what its rulers saw as the greater dangers of communism, Ba’athism, Nasserism and secular nationalisms – but also as part of a wider effort to spread the influence and reach of Saudi Salafism. The turning point was somewhere between Juhayman al-Otaybi’s assault on the Great Mosque in Mecca in 1979 and the aftermath of the Iraqi invasion of Kuwait in 1990. The Saudis realised that just as Salafism could shape other forms of Islamic orthopraxy and indeed orthodoxy, so could politically mobilised and ideologically dynamic transnational Islamism change the way Salafism was itself construed, particularly in its relationship to secular power. In the wake of the Islamic sahwa and the emergence of new and often insurgent forms of politically active, Brotherhood-influenced Salafism in the Kingdom and elsewhere in the region (here, here and here) they came to recognise the power of competing claims to normative and ideational hegemony, and the threat this posed to the way they themselves construed national cohesion and identity, at a time when this was already a matter of debate (for example, here). This alarm was heightened by the Arab Spring, which saw Islamist – largely Brotherhood – successes in Egypt, Tunisia and Libya and resurgent Islamist political movements in Jordan and Kuwait. The Saudis feared a repeat of their attempted encirclement by Nasser – only this time by Nasser’s ideological opponents, whose claims challenged that by the Saudis to be the legitimate modern incarnation of a classic Islamic polity. The Iranian trajectory has been the reverse. Radical clerical circles from the Constitutional Revolution onwards developed a relationship with other strands of emergent Islamisms, both Sunni and Shi’a. The first mobilised Arab expression of Shi’a Islamism, Al Da’wa in Iraq, which arose out of clerical circles in Najaf, modelled itself on the Muslim Brotherhood and developed links with dissident Shi’a thinkers in Iran from the beginning. The Islamic Republic helped create Lebanese Hezbollah as an instrument of power projection and sought, through the Shirazi current, to export its revolution to the Arab Gulf in the early 1980s. It then experienced a burst of pragmatism under Presidents Rafsanjani and Khatami but now – partly as a result of the space created by the US-led overthrow of the Taliban in Afghanistan and the Ba’ath regime in Iraq and the opportunities offered by the Arab Spring – is once more on the offensive in the wider region, seeking to exploit popular unrest against its enemies and support its friends by replicating the subaltern mobilisation of the Basij and Lebanese Hezbollah in Iraq, Syria and – in a more complex and opportunistic way – in Yemen and Bahrain. This can look like a movement over time between alternating poles of Sunni and Shi’a attraction and repulsion or of revolution and counter-revolution. But the rise of the Islamic State and its avatars and the entrenchment of powerful sub-state groups in the wreckage of Iraq and Syria in particular seem to me to represent a fresh phase in the evolution of a new sectarian order/disorder in the modern Middle East (here, here and here), which arises essentially out of the chronic secular failure of the regional state as a provider of security, citizenship and services (using ‘secular’ here in the Augustinian sense of ‘pertaining to this not the next world’ not the vulgarised version ‘nothing to do with religion’). And this order/disorder lies at the heart of the Saudi rivalry with Iran (here, here and here). Each side wishes – against the backdrop of what looks like a wider shift of global power – to shape a regional order that will promote its interests and guarantee its domestic security at a moment when each probably only has enough power to procure disorder. This matters to us for all sorts of reasons. Disorder in the Middle East and North Africa spills out into Europe, Africa and Central Asia. If this disorder, exacerbated by economic, demographic and environmental factors, is framed by theologised, decontextualised and dehistoricised ideologies – as with most forms of political Islamism – then the impact is that much greater. This is a criticism increasingly frequent in the region itself, often from the most unexpected sources. There are for others also the issues of energy security and of Israel. And this means making hard choices. Many policy makers may think there is a way for both Iran and Saudi Arabia to succeed at the same time, to back each side and to have a large cake and eat it. That is unlikely, though it is worth trying to see if post-election Iraq could form a field for some sort of cohabitation. But while we may know what success in our terms would look like in Saudi – and it is probably a version of what Prince Mohammed bin Salman (MbS) claims he wants (whether we believe him or not: for some reflections on the analogous Emirati model see here) – it is not at all clear that this secular version of success applies to Iran. Certainly, its reintegration into a regional state system would be a huge achievement. But this reintegration depends largely on its own actions and those actions are not random, but flow from an enduring – if often self-interested – belief among some elites of the Islamic Republic in its insurgent and revolutionary mission (here, here and here). Any serious policy to address these differences will mean both choosing sides and working within the bounds of the possible in a way Western governments have not done for two decades. Policy towards Saudi is essentially a bilateral matter. MbS’s ambitious remaking of the socio-religious compact is a domestic issue. But whether the JCPOA collapses or not, we have needed a wider collective approach to Iran for at least a decade. We still need it. Paradoxically perhaps, it is the Trump Administration with all its unpredictability that has restarted the debate – muted under Obama by a range of straw-man arguments – about what this would look like. This all argues for greater not less international – most notably US and European – engagement and coordination. There is no natural balance of power in the Middle East. And given the absence of trust and of verification mechanisms and severe imbalances in state capacity and national ambitions, there is unlikely to be a spontaneously generated grand accord or a sustainable Pax Russica. In the end the problems of the region can only be addressed by fully functioning and resilient states under the cover of a collective security regime designed to include Saudi and contain – not exclude – Iran. Such an enterprise for the foreseeable future – as over the past 50 years ­– can only really be sponsored by the US if enough major regional powers want it. Given our own domestic politics, those in the US and the incompatibility of regional ambitions, this probably lies a long way down the road. And there lie the limits of any policy recommendations that seek to bring order out of disorder in the Middle East. Sir John Jenkins is Senior Fellow at Policy Exchange in London. Previously, he was Executive and then Corresponding Director for the Middle East at IISS in Bahrain. Until January 2015, he was the British Ambassador to Saudi Arabia.